What are the differences between touch, ranged touch, and incorporeal touch attacks? What ability modifier applies to each of these attacks? All these attacks have one thing in common, the target’s armor, natural armor, and shield modifiers can’t defeat the attack (though incorporeal touch attacks provide some special cases). Enhancement bonuses that increase armor, natural armor, or shield bonuses also are not effective against touch attacks. An enhancement just makes its associated bonus a little bigger, but an ineffective bonus remains ineffective no matter how big it is. So let’s look a little more closely at both touch attacks and the armor system itself. A touch attack is a melee attack. You make a touch attack to deliver a spell with touch range, when grabbing a foe as part of a grapple or trip attack, or in almost any other melee situation in which the most important thing is just making contact with the foe’s body or equipment. Keep in mind that when resolving magical attacks, contacting a foe’s equipment is just as good as contacting the body. Since a touch attack is a melee attack, you apply your Strength modifier to the attack. If you have the Weapon Finesse feat, you may use your Dexterity bonus instead; your hand — or other appendage — counts as a light weapon. For trip attacks you may use an implement for the touch. In such cases, you can use Weapon Finesse feat only if the implement you use is a light weapon for you. For example, if you use a halberd in a trip attack Weapon Finesse feat doesn’t apply because a halberd is a two-handed weapon. While a really big creature can wield a really small halberd as a light weapon, that’s a highly unusual situation. Making a touch attack while you are threatened might provoke an attack of opportunity. It depends on exactly what you are doing with the attack. Refer to the rules for the kind of attack you are using to determine whether it triggers attacks of opportunity. A ranged touch attack is much like a touch attack, except that it is a ranged attack instead of a melee attack. As with any ranged attack; you provoke an attack of opportunity if you make a ranged touch attack while threatened. Also as with any other ranged attack your Dexterity modifier applies to the attack roll. An incorporeal touch attack is an odd duck. It’s actually similar to a slam attack. However, incorporeal creatures can pass through solid objects, and their attacks bypass most armor, natural armor, and shield bonuses just as touch attacks do (hence the attack’s name). Force effects, such as a shield spell, are effective against incorporeal touch attacks, as are armor and shields with the ghost touch property. Incorporeal creatures lack Strength scores, and their Dexterity modifier applies to both their melee and ranged attacks. An incorporeal touch attack is a natural weapon and making an incorporeal touch attack does not provoke an attack of opportunity. Can you make a ranged touch attack as a melee touch attack to avoid triggering an attack of opportunity? In most cases, you can’t. Perhaps the most common ranged touch attack is a spell, and most spells that you deliver with a ranged touch attack have effect entries. That is, the spell produces something that springs from you and travels to the target. Directing such a spell is always a ranged attack, even if you’re close enough to touch the spell’s recipient. Other ranged touch attacks might work as melee attacks, though most probably will not. For example, an attack with a net is best resolved as a ranged touch attack. If you were standing beside a foe you wanted to entangle in the net, you would still need to throw the net over the foe. That seems more like a ranged attack than a melee attack to me. I suppose you could smash a vial of acid against a foe’s body as a melee attack. If you do so, the acid will splash you. Is the attack you make as part of a touch or ranged touch spell part of the spell’s somatic component? Is it just plain silly to use the Still Spell feat with one of these spells? A somatic component is a precise movement necessary to complete a spell, much more precise that making a touch attack. It’s splitting hairs, but a touch attack isn’t part of a spell’s somatic component, even though you can make a touch attack to deliver a touch spell as part of the action you use to cast the spell. It’s not always a complete waste to still a touch spell, but it usually is. After all, you must move to make a touch attack. Because your attempt to make the touch as part of the action you use to cast the spell, you’re not “still” while taking the action. Today’s discussion of touch attacks brings to mind an old criticism leveled against the attack roll vs. Armor Class system. It goes like this: Armor ought to make you harder to hurt, not harder to hit. This argument underscores the need to understand what’s going on the game world when any particular game mechanic is in play. In the jargon of the game, an attack roll that succeeds is a “hit” and one that fails is a “miss.” That’s a handy way to talk about action in the game. It should be clear, however, that any attack roll that’s good enough to “hit” a defenders touch Armor Class actually does make contact with the defender’s body (or shield). When such an attack fails to overcome the defender’s full Armor Class the armor has defeated the attack and the defender’s armor has indeed kept the defender from being hurt. 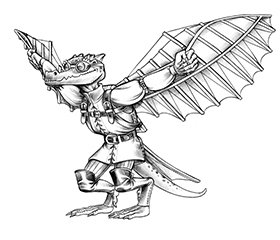 Ask the Kobold is a free service of the Kobold Quarterly site, and we’re always looking for good questions! 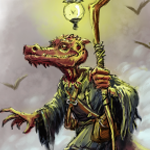 Stump the kobold in the comments. hey! i have been trying to find an answer to the tweo questions here for a long time! i had house rulled that ability modifiers counted, while BAB didnt, and now i find out i had it correct! Um, sorry Teal. BAB is still factored in to all attack rolls. The difference is that melee (touch) attacks use Str and ranged (touch) attacks use Dex. There is a special case for Weapon Finesse, though. For “discussion comments”, we should probably use the forums. Unfortunately, I don’t spend much time there.